One of the benefits of maintaining the Backdoor Survival website is that I am often asked to review various products of interest to the preparedness community. I have personally tested and used all of the products I have written up and as you know, it is always more than a simple “two-liner” or just the rewrite of a pile technical specs or press releases. But there are some products that I can’t effectively review because the Survival Husband and I do not always have the necessary review tools. In such cases, I occasionally turn to my long-time friend George Ure at Urban Survival, who’s one of the “old hands” at prepping, having exited from big city life in early 2003. 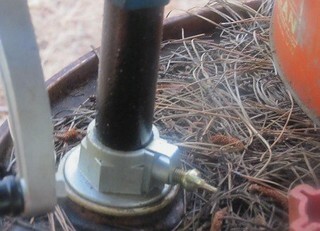 Living on a ranch (more of a tree farm now) in East Texas, he has everything needed to review fuel preservation solutions like the ones offered by the PRI-D folks which quite coincidentally, readers have also asked about. For those of you that are not familiar with fuel additives, Power Research Inc. manufactures fuel both gas and diesel fuel preservation products and will be providing the product of choice to one lucky reader – but more about that later. First, here is the report from George. When we moved up to our slice of the Outback , we were typical city-slickers, although I’d worked a bit summers as a boy in Eastern Washington, I got my first D-6 Cat bulldozer stuck in soft dirt along Crab Creek (just over the hill from Hanford) at age 12. Ever since then, my relation with diesels has had its ups and downs. A diesel engine is an incredibly simple machine, at least in principle. There is no ignition system, per se. As a cylinder is about to begin its compression stroke, a high pressure pump squirts a precise amount of fuel into the cylinder. Because air heats when it’s compressed enough, eventually, with a compression ratio up over 20 to 1 in many cases, the injected fuel explodes and that’s where the power comes from. To be sure, compression ratios as low as 14 can be used, but there are tradeoffs, not the least of which is the ability to fire off on cold mornings. A typical farm tractor may have diesel with under 20:1 compression, but in these instances, the engine is usually equipped with a pre-heater (or glow) plug. In cold weather starts, the glow plug is run for 15-seconds, or so, and then cranking begins. If you’re ever in a survival situation with a diesel engine, there was an old trick used by SeaBees during WW II when they were cat-skinning in Alaska to start cranky diesels on cold mornings: They’d shove a rag into the exhaust pipe! Believe it, or not, this small increase in back-pressure into the engine was sometimes enough to light off a cranky diesel. Using an old wine jug, I let the fuel settle for a day and snapped this picture. What it shows is two layers had formed. The bottom one was clear liquid – water with some barrel rust in it and other impurities – while the top layer above was a kind of gooey tar-like substance. You’ll see in the pictures as we go through my report here, a kind of “red” cast to the diesel. That’s because agricultural use diesel (“ag-diesel”) has red dye added to it so you can be caught and fined for running farm diesel on the highway if you have a diesel powered car or truck and the inclination to be something of a chiseler on taxes. On the other hand, farm diesel runs just fine and presumably, in the event of a National Emergency, or whatever, bureaucrats would have other worries than handing out fines for running lower tax diesel, but you never know about these things, so it’s a judgment call on your part. Be advised, in many states, especially Texas, you need to have a state-issued permit just to buy the farm diesel and you’ll periodically get polled by mail that you still operate a farm or ranch and are a legitimate user of farm-dyed red diesel if you’re not running “road” diesel. After reading through the brochure from PRI-D, I found confirmation of what I had previously (and wrongheadedly) thought was algae in the dark goo layer. Not so. It turns out that when diesel is refined, it’s not just a single level distillate in the cracking tower of the refinery. So it’s not algae, but rather some of the cracked “tars” and heavier distillates getting back together again and they can turn into fairly large tar-ball goo and that’s not going to run nicely, since it can plug up the fuel oil filter and muck up the diesel fuel pump. Diesel can include something of a range of distillates when being made, more so than gasoline for sure, and depending on how much of what is used in the diesel blend, there may be more of the heavier distillates than the lighter products used in gasoline. That, plus heat (or time) is what caused diesel to go bad. While PRI-D is already well-established for keeping diesel from break down well past the advertised 10-year mark, my problem was a little different. I wanted to get the diesel back into useful condition after it has goo ’ed up…that was my problem at hand. Why so much focus on diesel? It comes down to two reasons, really: One is in fuel weight. For reference, a gallon of water weighs 8-pounds (“A pint’s a pound, the world around”). Gasoline weighs about 6-pounds per gallon and diesel (depending on blend and temperature) will come in around 7.1-pounds per gallon. I know…you’re thinking “Does that mean diesel, gallon for gallon can get more work done?” Absolutely. If you look over here at the gallon equivalent of gasoline tables, you’ll see that base gasoline has about 114,000 British Thermal Units of heating power (potential work) per gallon. But diesel has 129,500 BTU’s worth or almost 13.3% more work in it for a given volume of product. Diesels are even starting to move into some unique applications, too. For example, the Aircraft Owners and Pilots Association recently reported on Lycoming’s drive to introduce a Jet-A fuel burning diesel to the aviation market. Presently in the US, low lead av-gas is cheap compared to Europe where it can top $20 a gallon. Diesel airplanes may have a bright future. Those are dreams for the tractor-ing set, mostly, so back to my wine jug sample: It seemed obvious to me that somehow water had gotten into my tank (the one that was open) but I didn’t think nearly this much water would come in simply due to condensation. Upon doing some inspection after a heavy rainfall, I found (thanks to wind) that I was getting enough water onto the tank-top that unfortunately a few drops had gotten in the fuel. And, to make matters worse, there was also a fair amount of pine needles that had accumulated on the drum. If you’ve got a sharp eye for farmerly things, you’ll notice the distinct lack of rust on the manual rotary pump fitting that screws into the top of the tank. That’s because this is one of those fancy aluminum pumps which I spent a few extra bucks on, thinking it would pay off. Save your money: This one hasn’t lasted any longer than the previous one, which I got just four years of service from. The problem is the pump vanes inside the pump head deteriorate fairly quickly, so I’ve got a note on my “farm supplies list” to pick up another back-up diesel pump. To be sure, you can get diesel moved around with a syphon, but getting a mouthful of diesel is not something you’ll be anxious to do often, although I’ve been reduced to it a few times in a pinch, but a bulb-type diesel and gas transfer system can be had at Amazon which will make life easier if (should I say when?) the vane typed rotary pump fails. The next step in the review was to load up some jugs of diesel and put them side-by-side to see how they would clean up with PRI-D added to one, but not the other. It was pretty obvious that the PRI-D was doing its magic, breaking down the gobs into something that my old Kubota could digest more happily! After letting the jugs sit for a while, as the one on the right continued to clarify more over the next hour or two, it was becoming clear that what my Dirty Diesel contained was being sorted into three layers. I didn’t get pictures of it, but once the settling was done (I gave it 24-hours not because it needed more than a couple, but because I got busy around the ranch with other chores) I simply decanted off the good fuel into the tractor. OK, fine, the PRI-D solved part of my problem, but that left a really ugly bunch of goo in the bottom of the wine jugs. What to do with that? Eventually it dawned on me that I could collect those two bottom layers and toss them into a bucket. Once all the diesel had been polished (as fuel cleaning is called), I would simply wait until we get back into the rainy season here in East Texas and dump the residue onto a burn pile of fallen tree limbs and such that accumulate over a season, along with dead trees that get pushed up into monster brush piles which are then burned. Burning as hot as a 15-foot wall of fire does, I figure that will be the end of my leftover residue problem. “One of the worst things you can do is to use a glycol/alcohol based additive to try to emulsify water in fuel. Never a good idea. Problem is simple. When encapsulated water hits a hot injector tip, it expands rapidly to steam and can literally distort or destroy the aperture of the injector. Any product that claims “makes water disappear” or “gets rid of water” is one to completely avoid! Even so, most consumer additive makers make products for water emulsification – relying on the ignorance of the consumer in these matters. I suppose we could as well, but doing so would be a gross disservice to consumers. Regarding long-term fuel storage – some simple practices will avoid the issue you observed. First – always best to keep tanks topped off, leaving little “head” space in which condensation will form. Second, always a good idea to have a good water separation filter on the tank intake line (assuming this is a large fuel tank). Third – a good idea to have a second water separation on the output line. I have attached a paper with fuel storage recommendations – mostly aimed at large commercial tanks, although they can apply to smaller tanks as well. The main thing to plan on, if your prepping involves storing fuel, is to understand that fresh gasoline (no ethanol) left untreated may last only a year, or so, before it begins to “varnish” and, after that how your equipment reacts to it may be something of a crap-shoot. One of the applications around the ranch (besides the tractor and back-up generator diesel fuel) where I’ve become something of a rabid convert is the PRI-G product where the G stands for gas. We have been on a vicious cycle the past few years of taking several piece of gear down to the local small engine shop every spring to get them running again after starter fluid and no end of curse words wouldn’t start them. I’m banking on not doing that next year because I will end the season by running av-gas treated with PRI-G through them. Then, if I don’t take the time to get them running about mid-winter, it may not matter since the varnish is what gums up the carb floats and clogs jets, especially the low-speed idle just on small two-cycle engines. As to the diesel? Well, I’ve now transitioned to the plastic tanks – which I’d picked up a while ago and those, I was told, were much less likely to collect condensation and, even better, they don’t rust. 1. The product should be placed in underground storage. 2. If tankage is aboveground, it should be sheltered. Tanks and aboveground lines should be coated with reflective paint to minimize heating of the fuel. 3. Tank should be checked for product last stored to prevent contamination of fresh product. 4. All rust and tank scale should be removed. 5. Storage tank should be checked for water monthly, and more frequently in winter months. 6. If water is present, it should be removed at once by bleeding from the bottom of aboveground tanks or pumping it out of underground tanks. 7. In the event biological growth is found in the fuel tank, there are biocides that will destroy or control this type of contamination. The better practice is to keep the tank free of water. 8. If the tank is underground, make certain the fill stem is tight and protected to prevent seepage of ground water into the tank. 9. Check all pipe fittings for leakage. 1O. Make certain no zinc, copper or copper alloys come in contact with the fuel. Any found should be removed. Tanks and piping should be of suitable reinforced plastic. If plastic cannot be used, black iron is the second best choice. 11 Have suitable filters installed on dispensing equipment to remove any particulate material, which might collect in tank and contaminate the fuel. 12 If possible, provide a floating suction intake. The cleanest fuel is normally found at the uppermost level of the fuel. 14. Store your fuel out of the sun, at least in a shady area if you’re in hot country. 15. Insist on using plastic 55-gallons drums is possible. 16. Don’t leave the fuel pump in the diesel tank because it allows air and (in my case) water to get in, which will cause work down the road. 17. Have at least two or three barrel bung wrenches around – they aren’t too spendy. 18. If you’re gong to be moving fuel, the safety way is with a barrel lifting arm which can be had from Harbor Freight and other heavy-duty hardware outfits. Don’t store fuel or flammable liquids near any possible ignition source. I have had had plastic jugs develop cracked seams over time and so keep them all outside, away from the family home. Fire prevention is everyone’s job. Oh, and keep it under lock and key, as rule 20½ . There’s just too much trouble bad people (or kids) can get into with a five gallon jug of fuel! About George Ure: George and I have been friends since 1970. He writes daily for his Urban Survival and Peoplenomics websites. Since moving to East Texas in early 2003, George and wife Elaine have enjoyed doing serious homesteading work including raising goats, gardening, and pursuing hobbies like ham radio and flying. Son of a Seattle fire fighter, George pictures himself as a kind of Renaissance Man, about equally comfortable driving a tractor, offshore sailboat (he lived aboard for 10+ years) or piloting his old (classic?) Beechcraft. PRI-G and PRI-D are industrial grade fuel stabilizers that allow you to store fuel indefinitely for emergency situations. These fuel stabilizers can also rejuvenate old fuel that has deteriorated. What provisions, if any, have you made to store fuel for the long term? This giveaway is open to residents in both the United States and Canada and the deadline is 6:00 AM Pacific next Tuesday. At that time, a winner will be selected at random using tools on the random.org website. In addition, the winner must respond to my email within 48 hours or an alternate winner will be selected. Note: If you are reading this article in your email client, you must go to the Backdoor Survival website to enter this giveaway in the comments area at the bottom of the article. For 20 years the Survival Husband and I owned a diesel-powered boat. We knew that if we wanted the engine to run – let along purr – during the Spring and Summer boating season, we needed to add a diesel preservative to prevent the nasties from growing in the fuel tanks over the winter. The same rule applies to the fuel we store for our generator and other prepping purposes. It goes without saying that sometimes it is the little things that make all of the difference. If you have not done so already, please be sure to like Facebook which is updated every time there is an awesome new article, news byte, or link to a free survival, prepping or homesteading book on Amazon. You can also follow Backdoor Survival on Pinterest. Bargain Bin: In addition to the PRI-G and PRI-D products, today I share some foundation items for your emergency kit. Sure, you still need to add food, water personal care items and a whole lot more. But these basics will get you started. PRI-G and PRI-D Combo Pack: This PRI-G and PRI-D combo pack is currently being offered with free shipping. PRI-D Fuel Stabilizer for diesel and PRI Fuel Stabilizer for gasoline are also available for purchase separately. Kaito Voyager 5-Way Powered Emergency AM/FM/SW Weather Alert Radio : This one has it all and a very reasonable price given its features. It will operate from any one of four different power sources including hand crank and solar and includes a radio, lantern, cell phone charger and more. It can be used with 3 AA batteries or an optional AC adapter. It is perfect for receiving NOAA alerts and the LED flashlight on its side turns into a flashing red SOS for emergencies. This is the emergency radio that I own. Kershaw OSO Sweet Knife: This “oh so sweet” knife is solidly built, stainless steel knife that comes razor sharp right out of the package. It will pretty much cut through anything the price is amazing. Rothco Type III Commercial Paracord: You can get 100 feet of Paracord for under $10. This is a real bargain but be aware that price can vary substantially depending on the color. See 44 Really Cool Uses of Paracord for Survival. Potable Aqua Water Treatment Tablets: Potable Aqua Water Purification Tablets make questionable water bacteriologically suitable to drink. Easy to use and the water is ready to drink in 30 minutes. One 50 tablet bottle treats 25 quarts of water. Cyalume SnapLight Chemical Light Sticks: Read all about light sticks at Lighting Your Way With Chemical Lighting. Coleman Rugged Battery Powered Lantern: This sturdy Coleman has a runtime of up to 28 hours on the low setting and 18 hours on the high setting but does require D cell batteries. Personally, I have both a battery operated and propane lantern. Of course by now you know that I like redundancy with my preps. Windstorm Safety Whistle : This particular whistle can be heard a long distance away and above howling wind and other competing sounds. Swedish Firesteel: Using this basic pocket fire-starter, you can get a nice fire going under almost any conditions. This is a small, compact version. Emergency Mylar Thermal Blankets: These come in compressed packets small enough to fit in a pocket or wallet. You will be surprised at how warm these will keep you. $8 or less for a pack of 10. GI P38 & P51 Can Opener Combo Pack (Made in the USA) : This is one of the army’s greatest tools. Can be used for dozens of jobs. Makes a great can opener, cutting edge, groove cleaner, screw drive, clean finger nails, open seams and many, many more practical uses. Now you can have one of each size – at the time of this writing $1.25 for both. EMERGENCY ESSENTIALS Mountain House SUPER SALE! 40-50% off all cans! This month Emergency Essentials is having a huge sale on Mountain House Products. The selection is huge. Not only that, for a limited time shipping is free on all orders of $150 or more. One of my personal favorites is the Mountain House Chili Mac (shown below) which is 40% off at $15.89 for a #10 tin. And for a snack or dessert, the Mountain House Ice Cream Sandwiches are one of the Survival Husband’s favorites. I am more of a fruit person myself. This is by far one of the best sales I have seen on Mountain House. The only problem I am having is deciding how to spend my $100 Emergency Essentials budget this month! Gaye, great article and very timely with winter coming on… I’m not a diesel user but with several gas powered pieces of equipment I’m kinda picky about fuel. The closest ‘non ethanol’ fuel is 50 miles away or I’d stay totally with non ethanol. I keep all my gas stored in 5 gal plastic containers (much easier for an old man to handle)_ and I usually have 30-50 gallons on hand. I use FILO rotation and every can is treated with STABIL.. with good results. I’d be interested in trying the PRI product for gasoline… any type of prevention is better than tearing down carburators ! We are doing a terrible job of storing gasoline. I’m finally getting hubby to work on some “man” stuff so we should get up to speed soon. This article is just what I’ve been wondering about — how do you keep your stored fuel from going bad. The FILO method was all I knew. The additives will make life simpler and put my mind at ease. Thanks. The current gas is made to only last, in good shape for 3 months. PRI keeps your gas for 1 yr, then add some more to make it go for another yr. Great stuff!!!! We keep our gas and diesel stored in 5 gallon cans at this time. Usually about 40 gallons of gas and about 20 gallons of diesel. We treat everything with Stabil. And of course rotate it FILO. I’d be interested in trying out something new. We recently bought a diesel powered vehicle and are busy “getting to know her”. So far, so good. We have not begun to store fuel yet…our past experience with gasoline storage was not very positive. After reading George’s article I now know why. I will begin by gathering plastic storage containers and watch for diesel prices to dip a bit…then buy it up as my storage capacity can handle. We’ve also recently purchased a propane powered generator because of the fuel storage problem. Once again a terrific article. I look forward to each and every one which you produce — it is a great service to all of us. And thanks to George and all others who provide assistance. I have plastic cans with gas for my generator to be used when power goes out, and I need to keep it running for at least 3 days, before hitting vehicle tanks for more. Sigh. I have no safe place to store fuel, the landlord has the garage stuffed! But I do try to keep a full tank of gas in the car at all times. I put stabil in my 5 gallon gas can at the end of each year but plan on checking out the PRI products and increasing my storage in the near term. I have some gas and diesel stored in 5 gal. containers for daily use but some of it is older. I have put Stabil in them. I’m thinking that PRI products are what’s needed. We live out in the country off-grid and PRI should make a big difference. Excellent article. It has really helped me contend with fuel storage. Right now I only store enough gasoline to fill the tanks of our two vehicles-about 30 gallons. I have been using Sta-bil with varying results. I rotate the storage about every three months and have occasionally had issues with my engine “coughing”. I’d love to try Pri-G and stetch out the storage time. Kind of a ‘set it and forget it’ for my fuel storage. We store our gas in gas cans but would like to get a larger container. PRI products are used by the farmers around here in their overhead gas tanks for tractors. I keep about 20 gallons of unleaded stored in 2.5 and 5 gallon plastic containers. I treat it with Seafoam because that is all I was aware of. I try to use ethanol free gas when I can but it is super expensive. I also drive on the first quarter tank in my vehicles. The down side of my storage is that even treated the ethanol gas goes over very quickly. Would love to try the Pri-G product. I have just started my preps in the last year and I had not even given any thought to storing gasoline. I aways left that kind of stuff up to the man in the house. Well, I am alone now and have to do this kind of stuff on my own. Thank you for the list and I will be adding gas to my preps. After several cloudy days and I had run my solar charged batteries down, I found I was low on generator gas. I drug my feet about the long drive into town for more, when it occurred to me I had several junk cars that had gas in them. I didn’t dare use that gas. But, now with PRI-G and PRI-D combo pack I may store gas in these old car gas tanks. I may also dare to start my old diesel school bus that I use for a shop. As for the Old gas in your Old Cars, even if the gas becomes tarry like, put in the PRI and give it time, it will rejuvenate it. You can get PRI-G for gas, and PRI-D for diesel. The PRI Corp does not make anything except PRI, for the big Tankers. — You can also put PRI in your Car’s gas tank to help clean it out. Put it in when you are going home and need to filling up. So the solution gets mixed around, and when at home it gives PRI time to correct your gas in your tank. Or you can also buy it on Amazon. I have not yet made fuel storage a priority. We keep our gas in 5 gal containers at the moment and some smaller ones for the yard equipment. We use Stabil for long term storage and in the tank on the boat at the end of the season. Looking into getting some larger in the future. have stored/used diesel in on farm tanks for 20 years, turn over was quick and concerns for keeping fuel good not a problem. now that the Pri products are available I feel comfortable in increasing my long term storage without fear of fuel going bad now(costly) or when needed in emergency or SHTF occurrence(deadly), currently using 300 and 500 gal storage tanks as well as numerous 5gal plastic tanks, each with Pri in them. I store 500 gallons of diesel for my backup generator and 500 gallons of gas for general homestead use. Although I rotate my gasoline fairly quickly over the course of a year, I still treat it with PRI-G as insurance. My diesel stockpile is used much more slowly. I treat it each fall with PRI-D to keep it fresh. After introducing the PRI-D, I insert a length of garden hose into the tank. Using a portable compressor, I force air into the tank, thereby agitating the fuel and mixing in the PRI-D. This is something I haven’t any information. Not owning a car nor other vehicle, it hasn’t entered into my plans. Guess it would be me hoofing it along with my dog pulling his cart. At least I’d be gathering/foraging food as I went so I wouldn’t have to carry so much. I still like knowing this info. Might give me a plus for bartering if/when it’s needed by someone. Thanks so much for this. We have some diesel stored and are working on storing some gasoline for chainsaws etc. I Love, Love, Love – PRI. I found out about it almost 2 yrs ago. I actually called up the Co. and one of the executives actually talked to me about their product. This is the only product that they make, and the Big Tankers use this product. This is a GREAT Product, for anyone who has not used it yet. Once the bottle is opened, you have a year to use it. As for an Un-Opened bottle, it has a long life. So buy a couple of them. You can buy a small bottle, or a larger bottle. If you are saving gas, please buy this stuff to protect it. You can also put it in your car’s gas tank, or put it in an Old gas tank that has gunked up, and it will help to Un-gunk it. Oh, forgot. You can’t buy it from the Maker, but they have lots of distributers now. If you can’t find one in your area, call them. Otherwise, you can buy it off the web. I have been searching our area for a PRI distributor with no success after first reading about it on Survival Blog a year or so ago. I work part-time for a big chain auto parts store, and they will not get it for me. FRUSTRATION! Anyway, I know now I will have to travel some distance to get it, so I will do that in order to facilitate long-term storage of fuel. After an extended power outage last Christmas time, I now have several 5-gal jugs of gasoline for our generator and have been treating them with another fuel stabilizer brand because it is was the only brand available at the time. I’ve heard such good things about the PRI- products from the survival community that I plan on acquiring some next time I cycle out my fuel. I live in a downtown apartment right now, and there is no place to store fuel for my car. I do however have several cooling fuel sources stored, and always keep my car tank full. Hello, we store approximately 30 gallons of gasoline for emergency use in our generator and vehicles and 80 gallons of diesel. I treat both with Sta Bil and rotate them through the vehicles every 6 months. Been doing it this way for many years. During Sandy I commuted with my diesel pick up and we went through all our gas reserves before the power came back 10 days later, diesel was available EVERYWHERE. In fact my wife made a “Buying Diesel” sign for the truck so not to infuriate the gasoline buyers on line. I have heard good things about the PRI-D and G products and will be purchasing both in the very near future. Thanks for a great article. This article was super informative for me. Just started our preps this summer, accumulating gas cans at garage sales. We have a few 2.5g & three 5-gal so far, all filled. I never gave any thought to treating the gasoline for long term. I really learned a lot from reading this review! Now is probably the time to add some PRI before winter comes. I’m a newbie at this, but am learning new things every day, thanks to you, Gaye! I just filled three plastic gas cans for storage and just happened across this article. The info was very good and the comments were also helpful. I will be obtaining the PRI- product asap. So far, other than keeping some on hand for the mower and chainsaw, sadly gas had not been a priority. With the coming November “Grid Down Drills” planned by our illustrious government, we are aabout to embark on rectifying thisn situation. Soon. Keep up the as always great work Gaye!!! Great article! I have a selection of gas cans, almost always all empty. My family will use up what I have, and not only not refill them, but not bring an empty one even when they’re going to buy gas, or set out to buy a gas-powered item and purchase another gas can because they didn’t check the ones in the shed. I’m due to fill them all back up again, but I’m also considering a barrel or gas caddy, either would double the fuel on hand. I’ve read about using Pri-G/D before, but now I’m sure I’ll want it when I fill a caddy or barrel. I did NOT know you could recover fuel. I have not yet made fuel storage a priority .. not sure how it was done .. after reading this i better get on to it ! thanks !! Great article, answered lots of questions. I have 4 five gallon plastic gas cans to fill. Would love to win the Pri-G. Will buy some to use even if I win! Not a good job at all. But the great information in this article has inspired me to get started now. I have been storing a few cans with Sta-bil. I’m always worrying about using the gas before it goes bad and then getting my cans refilled. This product is exciting! I will get some one way or another! Just wondering if I can put this in my cans that already have Sta-bil in them? Thanks so much for bringing this to our attention. There is no issue with adding PRI to fuel that has been previously treated. annually and your fuel will remain fresh. I appreciate this information. I had not considered storing fuel. I am happy to know now that it can be easily done. I keep about 80 gallons of fuel, all in 5 gallon containers for ease of use and regular rotation. I use a fuel stabilizer and have used fuel stored for over a year and a half, a long time for today’s junkie fuel. It normally stinks, but works just fine with no running issues to date. I also have a tractor I use on my property to keep my roads open and for heavy duty snow removal. It runs on diesel and its use is irregular so I put fuel conditioner in the fuel tank and in my 5 gallon storage containers as well. I’m anxious to try this new product, always looking for the best. I’ll order some on Amazon as soon as it’s available. I can’t afford a product that does not work as advertised as I’m many miles outside a town and several miles from the nearest paved highway. Long term storage of diesel or gasoline in plastic containers is a poor idea unless they are underground. 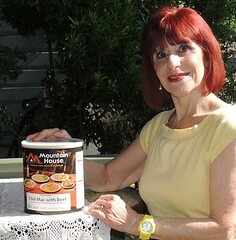 There is air permeability in plastic containers. Air is evil to fuel. You can coat the inside of your metal drums with a gas tank sealant to prevent rust and metal ion transfers. Also light can get into plastic containers and will destroy the fuel quicker. Gasoline and to a lesser extent diesel will eat plastics not especially made for fuel. So water or food based drums will leak quicker. The best storage for fuel is glass, then metal, and last plastic. So please read up on how you store your fuel I would hate for someone to take bad advice and blow up a barn or heaven forbid their house due to a easily avoidable fuel leak. Enjoyed the article. Don’t usually fill tractors when hot for safety sake. Usually do when I start or occasionally when just walking by. Others use one of the 3 tractors and a diesel ATV we have. Love PRI-D and G. Have a similar story where a friend wanted to move an old diesel tank that was half full. I had just bought a portable diesel tank. He borrowed it and pumped out some old dark diesel into my tank so he could move his lightened tank. I added some Pri-D to the dark fuel he had given me. I gave him a bottle to add to his old fuel but for some reason hasn’t used it. In a day or two I drained the tank and the fuel was light red. There was a little water that I drained out. Have since pumped out two hundred gallons of old fuel oil from heater tanks. Added PRI-D at about twice the rate to this. Drained water from this and added biocide. The fuel is all bright red now and no sign of water. Will check again in a month or two in case some has come out of solution after transfer. 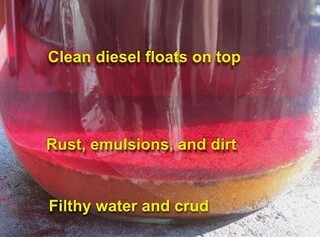 Have used diesel fuel over 10yrs old with no problem. Always filter when pumping. Every fall or when adding new fuel to tank add suggested amout or more of PRI-D. No fuel problems at all for over 10years. Do keep all tanks full. Add cetane booster in winter. Use synthetic oil in winter, esp in standby generator. Should make easier to start and better lubrication while cold. 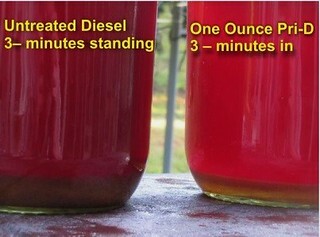 Believe diesel fuel is best most reliable fuel for long term use and storage. Also get ethanol free gas for 2 cycle saws etc. Friend of mine has had a lot of equipment ruined by ethanol. Add PRI-G or stabil to that all the time and have had almost no problems starting saws that I haven’t used for months which amazes me. AWA P.S. tried to use diesel in one of those kerosun type space heaters. Can’t seem to get it to burn clean enough that my family doesn’t complain. Anyone any suggestions next winter might try again if I can de-soot my space heater. I didn’t know that clean diesel would float above the dirt and dirty water. We have been wanting to store some extra fuel for the winter and I didn’t know how everything was sifted and divided when left standing still. I’ll have to remember what you said so I can have fuel for the fire this winter.